Lithograph by Henry Schile 1874. Courtesy of the Library of Congress (LC-USZ62-89586). A most prominent opponent of slavery, U.S. 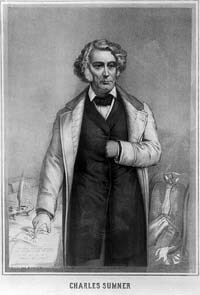 Senator Charles Sumner, attacked slave power as an alliance between “the lords of the lash and the lords of the loom.” A master orator without notes, he was likewise adept in facilitating the formation of the Republican Party in opposition to slavery. His famous address on “The Crime of Slavery” released his rage against Senators Stephen Douglas of Illinois and Andrew Butler of South Carolina. Two days later Congressman Preston Brooks of South Carolina attacked Sumner when seated at his desk, mercilessly beating him with his cane until he fell to the floor in bloody unconsciousness. The wounds were so severe it took three years of healing before Sumner returned to the Senate. His seat had been kept open by the grateful people of Massachusetts. A confidant of President Lincoln, Sumner was influential in encouraging the Proclamation of Emancipation. He died when, against his doctor’s advice, he went to the Senate on a day crucial for voting and suffered a terminal heart attack.